ALLIANCE is a Web-based communications portal that provides users with an efficient means to share information regarding at-risk properties. The program allows for a cooperative exchange of information enabling all parties involved to connect via a common platform and share information before engaging in a lengthy and potentially expensive violation recording and remediation process. 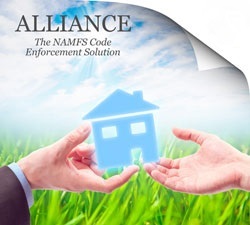 Code enforcement officials and HOAs input property-specific information, including the code-related issues, comments and potential fines if not addressed via an electronic form. NAMFS’ participating members then receive this information and agree to (a) review these properties and initiate contact with the appropriate party or (b) indicate they do not service the property.